Some users of Galaxy Y S5360 may think that their phone looks boring as it stays with them for quite some time. Due to the fact of limitation, there are users coming up installing Custom ROMS or Apps that may cause the device rebuilding into an adorable one. Perfect! Applying changes on the Galaxy Y using Stock ROM also lead to worse outcome. Such as, unable to receive signal, losing the IMEI which is the most important one. But the most common thing happen is bricking the phone. Bricked Galaxy Y causes malfunction to itself; like phone keeps on rebooting or stuck on the start up logo. The procedure I intend to share requires downloading certain files. Also, this will bring back the phone to its factory defaults. Reverting the customization done by the user. Well, your Galaxy Y S5360 comes back to normal on its unrooted state. Follow this simple tutorial to fixed restarting, hang or frozen Samsung Galaxy Y. After downloading Samsung Kies USB Driver install it if you don't have one. Extract the zip file Odin3-v1.85, open the folder and run the program Odin3 v1.85.exe. 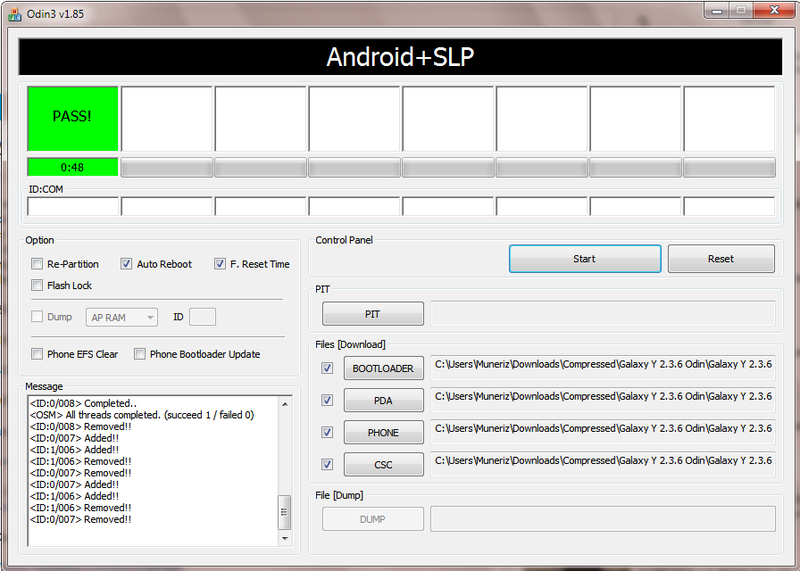 Extract Galaxy Y 2.3.6 Odin.rar, it contains flashfiles for Odin seperate boxes. Remember the path or location of the folder. Now, Going back to Odin3, tick boxes of Auto Reboot and F.Reset Time and let's place flash files in their proper boxes. Put your Samsung Galaxy Y into download mode by pressing VOL Down, Home Button and Power Button at the same time. It will ask you to press VOL UP button to continue the download mode. As your Samsung Galaxy Y in state of download mode plug the Micro USB cable and connect it on your computer. USB driver should be installing where Samsung Kies do the rest of this job. Check your device manager to verify the installation. Click the Start button of Odin3. Wait 'til flashing is completed and don't disconnect the cable or phone while flashing isn't yet finish. Above green-colored box with "PASS!" means flashing is completed and your Galaxy Y S5360 is good to go! Thank you for reading Steps to Fix Samsung Galaxy Y S5360 that Keeps on Rebooting or Stuck on Start Up Logo [Fried and Toasted!] posted on the website Kwentology if you want to redistribute this article please include the link as the source. Have some kuwento to share? Contact us!